Actual client results. Results shown are after only two months of treatment. Acne can be a very complex skin problem, there are many types of acne and many different causes. It takes a trained and well educated professional to spend time with a client in order to uncover the underlying cause. It is imperative to get a full history, which includes diet, lifestyle, general health and family history. All acne is not treated equally. Once we can identify the cause we can work on the cure. There are many misconceptions regarding acne. Many of my clients come in thinking that their oily skin is the root of all evil and they spend most of their time consumed with popping, picking, drying, and covering up their acne. If this sounds familiar, please read on! The most common misconception I encounter is that, “my oily skin is the reason I break out.” Actually, oil does not cause acne, bacteria is the most common culprit. When the oil cannot be expelled normally and it is “trapped” in the pore, it can breed bacteria and become infected. This is the life of a “pimple” or worse yet a cyst. When one pore becomes infected it can spread easily to adjacent pores. When there are multiple large clusters of infected pores you have cystic acne, a painful and unattractive condition, which can play havoc on our self-esteem and make one very self-conscious. It is also something that may require medical attention depending on the severity and the location. If the belief is; acne is caused by the oil, the first thing people reach for is something to dry up the oil. This usually results in a surface drying of the skin and subsequent overproduction of oil. The skin tries to normalize and so it will produce even more oil. When we dry the surface of the skin, we get even more build up keratinocytes (dead skin cells), blocking the natural oil from being expelled, as it would in healthy skin. In other words, don’t fight the oil, embrace it. It will keep you looking younger and will protect you from many environmental factors leaving you with healthy, beautiful skin. Oil is necessary and needs to be able to flow freely out of the skin. It’s not the oil causing the acne, in some cases, it’s over drying of the skin and bacterial growth that can cause the problem. What are acne products actually doing? The repetitive use of drying agents like benzyl peroxide and salicylic acid, in the long run do more damage than good. I understand that people with acne feel desperate to dry up the oil and clean their skin, but they really end up just stressing their skin out. Almost any product you buy that labeled for acne, whether it’s a cleanser, a wipe, or a multi-step program, will contain benzyl peroxide and salicylic acid. These ingredients are not “bad” but when used repeatedly they can be very harsh and drying. In addition to the products already mentioned, harsh scrubs are another favorite OTC product. These large granules actually tear the pores and enlarge them, making prime little pockets for bacteria to collect. It’s common in these cases to see a large amount of blackheads. Once a pore is torn and large, nothing in this world is going to make it small again! We can improve the appearance of large pores over time, but we will never be able to change the size. Picking, popping, and extracting, OH MY! The very worst thing that you can do is to extract a lesion on your own. This needs to be done by a well-trained esthetician and it should not be a very painful process. Forceful extractions can cause deep scarring. It also can spread the bacteria that’s inside to other areas of the face and causing further breakouts. The risks involved are much greater than the benefit. This is particularly problematic in darker skin tones — the skin hyper-pigments much easier than lighter skin tones. A cyst should never be forcefully extracted. Leave it alone and consult with either your esthetician or dermatologist. A cyst, depending on its location on your face, can cause some very serious problems that need to be addressed by a physician. For example, if it’s too close to the eye, the infection is deep and you don’t want it to spread to the eye or the sinus cavities. You shouldn’t be thinking about a cyst like it’s just a pimple and that you can just expel the contents. A cyst is a much deeper infection and sometimes requires the use of antibiotics or local steroids. 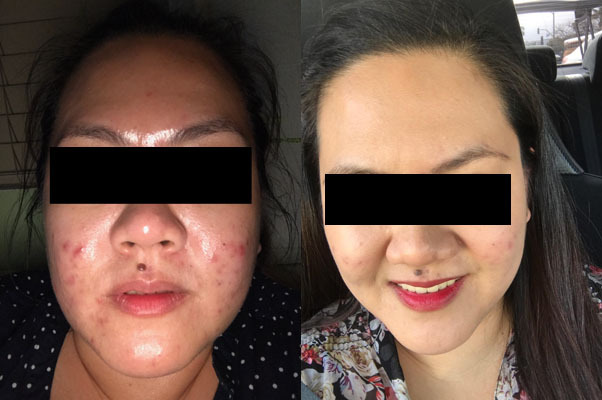 The condition of PIH (postinflammatory hyperpigmentation) can be the result of severe acne, picking, popping, improper extractions, and from not using sunscreen over damaged tissue. In order to avoid these complications it’s best to get in the habit of not touching your face and getting regular facials by a qualified esthetician who can safely do extractions for you, and above all, wear sunscreen every day! There are many different causes of acne. We can’t just talk about how acne is caused by too much oil or bacteria on your face. Some other causes are hormonal imbalances, overgrowth of bacteria in the gut, or deficiencies in certain minerals. It’s only with a thorough and detailed history of diet, lifestyle, and health problems that we can really determine the root cause and not only take care of your skin from an external way, but we must treat the internal causes as well. Some of the things that I see in my practice are an overgrowth of bad bacteria in the gut, when people have IBS (irritable bowel syndrome), or gluten intolerance, or other food sensitivities. The use of probiotics in some of these cases can be very helpful. Hormonal imbalances are a bit trickier, and depending on the severity, it’s best to be treated by either an OBGYN, endocrinologist, or dermatologist. Sometimes a combination of treatments, like an additional zinc supplement plus a probiotic will help along with proper diet changes. So what is the best acne treatment? The best acne treatment is going to depend on the cause. For the sake of this article, I will give an overview of a general treatment. The most important thing to know, if you have acne, is to get rid of all your beliefs at this moment and all the things you were taught by the media and by marketing in regards to skin care. If you are a normal, healthy individual with no underlying disease and you have acne, I would start you with an education about how to treat your skin on a daily basis. To start, you should cleanse your skin only one time a day with lukewarm water and a cleanser at night. I prefer a cleanser that is antibacterial and not highly concentrated in drying products. We simply want to cleanse the skin and kill the bacteria. The second thing would be the addition of oil. Adding oil to your skin is counter intuitive, but it’s actually a wonderful treatment. By adding oil, we are sending signals to the sebaceous glans to relax and not over produce. The addition of vitamins, in particular vitamin A, in the form of Retinyl Acetate is essential in keeping the cell walls intact and healthy. Vitamin C and vitamin E are both strong antioxidants which help protect the skin from free radicals and photo damage which includes scarring. When you massage a small amount of this type of oil into your skin, it’s like taking a multivitamin for your skin every day. Lastly, it is imperative that you use a sunscreen every single day, rain or shine, inside or outside. When you have a scar that is exposed to the damaging UV rays of the sun, you will get darker and darker scarring, and it’s not pretty. It’s also of the utmost importance that you get in to see a well-trained esthetician who can sit down and take the time to understand your personal history and uncover possible causes of the problem.